Gobbledygeek episode 97, “War! Huh! Good God, Y’all!,” is available for listening or download right here. 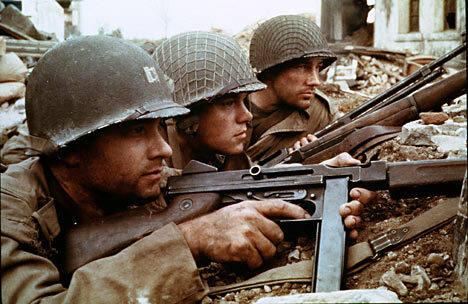 Memorial Day is next weekend, so to get in the spirit, the boys have come up with a list of the Official Gobbledygeek Top 5 War Movies. Without giving too much away, we’ll say there are a couple Spielbergs in there along with a couple others that are alternately meditative, pulpy, and batshit insane. Which, you know, war. Plus, Paul and AJ spout off about The Avengers some more, as both are baffled by a simple point that numerous critics have failed to grasp; and Paul mentions the Alabama Phoenix Festival, at which he’ll be appearing on a few panels from May 25-27. Check it out! Next: the boys have decided to slack off or Memorial Day, so no show next weekend. When we come back, there will be a Geek Challenge! In the meantime, grill some hamburgers and hot dogs for us. This entry was posted in Shameless Self-Promotion and tagged albama phoenix festival, edward burns, film, gobbledygeek, libsyn, matt damon, memorial day, movies, podcast, saving private ryan, steven spielberg, the avengers, tom hanks, war, war movies. Bookmark the permalink.